Welcome to fishing in legendary Key West. I'm Captain Lenny Leonard. Have you caught yourself day dreaming about fishing the shallow water flats off Key West, the Marquesas, and the Lower Florida Keys? 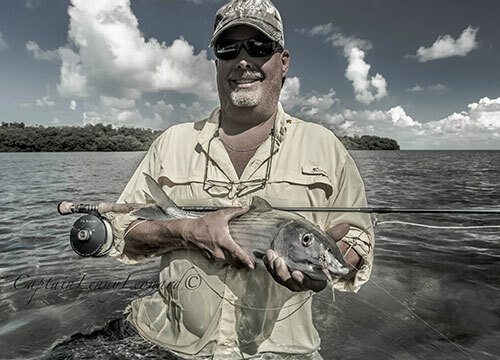 Have you ever made a cast to a school of feeding bonefish, or stalked a tailing permit? How about fly fishing for a daisy chaining tarpon, or doing battle with the most feared of the ocean going predators, the shark or barracuda? Key West has the much deserved reputation of having the finest flats fishing found anywhere in the world. 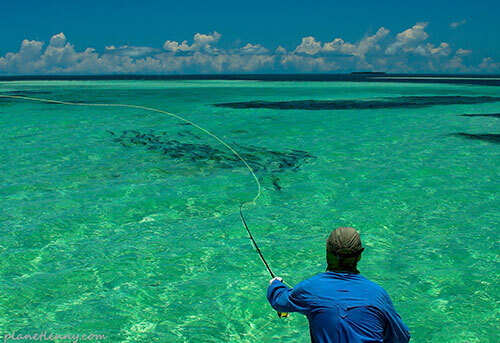 Whether you are spin casting in the back country Snipe Keys, or fly fishing in the far western atoll known as the Marquesas Keys, you will enjoy the challenge of light tackle sight fishing. You can catch them all: tarpon, permit, bonefish, shark, and barracuda. You could even be lucky enough to catch the grand slam. Can you imagine catching and releasing a tarpon, permit, and bonefish all in the same day! I've seen it done. Key West is also loaded with the fun fish. Jack cravalle, bar jack, ladyfish, snook and redfish roam the clear, pristine water in and around the flats of the Lower Keys and Key West. Key West is just minutes away from the most exciting flats fishing you will ever experience. I hope we will soon meet, so we can share the experience of "Fishing the Flats."